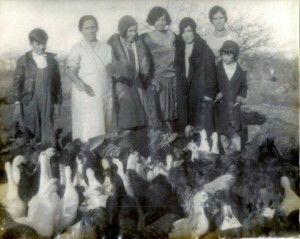 Photo above of Dad, Vavo, Nina and visitors to the farm (c. 1928 Swansea, MA). his contradictions, character flaws and idiosyncrasies, perhaps even with them, he was one of the most fascinating, frustrating and finest men I have ever known in my life. I hope that you will forgive me for not posting a reflection here on this weblog these past months. Only in the last several days have I felt some sense of resilience returning to me. Deep mourning still abides, but I think I am feeling less pressure from being completely dejected over my father’s death. When someone like a father dies, especially a beloved one, part of you dies with him as well. Now that I feel life pouring back into me, I also understand that, unfortunately, a true friend is now gone from me. Even though my father lived to the incredible age of 98 and four months old, and I knew that death was imminent for him; yet, I did not think that it was coming for him on January 27th. I wanted to go places with him, talk about things we would see, hear his familiar stories, and just be with him for a while longer. He was the first storyteller I knew. From the time I could understand the English language, until I became a senior citizen, I loved to hear my father tell his stories. Instead of merely concentrating on his death, this post focuses on the quality of life that he lived. Victor Marie Hugo was a French poet, novelist, and dramatist of the Romantic movement. He is considered one of the greatest and best-known French writers. Outside France, his best-known works are the novels Les Misérables (1862), and The Hunchback of Notre–Dame (1831). Certainly, Hugo’s quote above helps me bear this loss because my dad lived such a full and abundant life. Knowing this fact helps lessen the sting death has mete out to me and to my family. 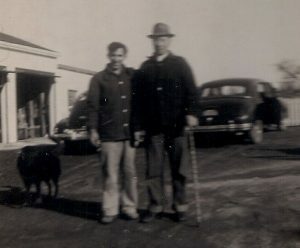 Dad & Vavu (late ’30s / early ’40s). What I would like to do in the next couple of blogs is to provide a testimony to my father. It is based on the eulogy I gave for him on the day of his funeral, which was on Friday, February 3, 2017. The format I am using here is one of providing the reader with vignettes, or literary sketches, of my father’s life and my love for him. 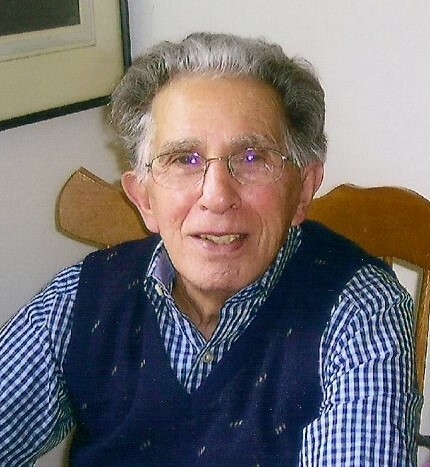 Alfred “Fred” Carreiro was born in Fall River, Massachusetts on Thursday, September 26, 1918. On that same day, beginning at 5:30 in the morning and preceded by a six–hour long, Allied bombardment the night before, 37 French and American divisions began their offensive maneuvers against the German lines. It presaged what is now known as the Meuse–Argonne offensive, which was the last major military action in Europe of World War I.
Woodrow Wilson (1856-1924) was the 28th President of the United States. The modern banking system, the Federal Reserve, was five years old. Commercial radio didn’t exist until 1920. Allied Supreme Commander Ferdinand Foch (1851-1929) proceeded to try cutting off the German 2nd Army that was positioned in the Argonne Forest, he placed General John J. Pershing (1860-1948), Commander of the American Expeditionary Force on the Western Front, in overall command of this maneuver. 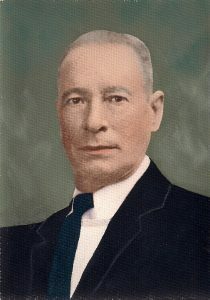 Vavu Jose Carreiro (c. 1948). 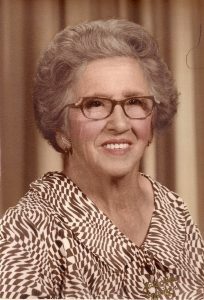 Vavo Ermelinda Carreiro (c. 1960). erupting across the world and becoming the planet’s deadliest pandemic in modern history. 50 percent or about 43,000 of the American soldiers killed in the war died from the “Spanish” flu. It eventually infected around 500 million people, roughly one–third of the world’s population, and killed an estimated 20 to 50 million victims. 25 percent of Americans became ill; some 675,000 American died. Tia Rose & Dad (2005). 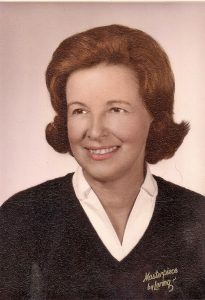 Tia Adeline “Nina” (15 September 1965). they were in America. They had their own land and home, they had family, a deeply held belief that right was on their side and they were proud to be new citizens of an amazing nation. My grandparents and parent’s generations lived during the time before, and when, electricity was beginning to be an accepted modern convenience. They lived in an agricultural world. Horses were the main means of conveyance and helped them perform work on the land. The hard scrabble life they lived and the amount of physical labor they performed are not to be taken lightly. I do not believe that my generation and those following me can even fathom the toll such toil takes on a person’s body and mental attitude. Given the quote below by Jefferson, and despite the labor my family experienced, I would say they were the luckiest and most blessed people in the world given the amount of sweat equity that was exacted from them at this time in their lives. When my father talked about the time he grew up in, he did so with great pain over the abject poverty they experienced and the sheer physicality, even brutal nature, of the labor they spent on surviving here as recently settled immigrants. Yet, they still felt wealthy. They had their own home, they had plenty of food (crops they planted and harvested and animals they bred, butchered and ate); and they had one another. It was a time in their lives that they never wanted to go through again, but nevertheless were very proud about; and, they would not part from having such memories for any thing this world could offer them to forego. Family meant the world to them. Group Shot (October 1941). 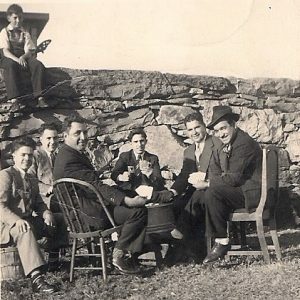 Dad is seated in the middle with his back to the stone wall his father built by hand. 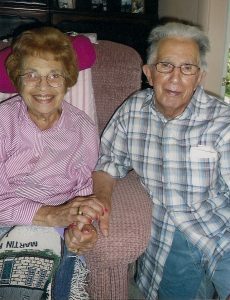 They had a profound and abiding love for the land they lived on. Their parents brought with them their Azorean passion for music, their language and religion. My dad’s generation fell in love with America. They entered the full fray of its politics and its culture. They embraced the popular music of the late 19th and early 20th centuries. They loved American technology, especially my father, who quickly became quite adept at fixing everything around him. 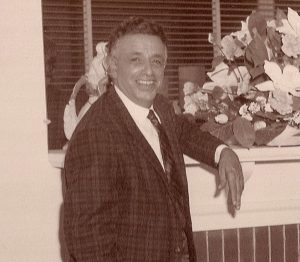 He not only developed the expertise needed for the care and attention to keep equipment running, but in doing so, he saved the family a tremendous amount of money and little or no down time for broken machinery. Their sense of humor was keen. They appreciated excellent storytelling and its capacity to represent the plight of the human condition. At the same time three of them lifted the back end of the flivver, two more placed wooden coca–cola crates underneath either side of the rear axle. When the Tin Lizzie was set down on them, the crates could not be seen and the back end tires of the automobile were only about an inch off the ground. The boys hid in some nearby bushes and watched the man approach his car, go through the procedure to start up the car,†† and then attempt to drive away. The resulting puzzlement, confusion and then anger the man displayed over his car remaining stationary just floored them into uproarious laughter. He actually got out of the car and looked all around it to see if he could spot what was wrong with his pride and joy. He gave up trying to figure out why he could not drive away on the third time he got out of the driver’s seat to examine the car. This incident proved to be one of my father’s favorite stories to share with me. The sheer physicality of the work and hard labor that all of them did on the farm were beyond belief, especially in terms of 21st century postmodern Americans. From before sunrise to well after sunset, work was one constant that they could count on experiencing. I remember that Dad, his brother and two sisters all would remark how mind numbing the work was that needed to be done on the farm. Often, they would even take on extra jobs outside of the farm to bring in more money in order to pay the bills to live. 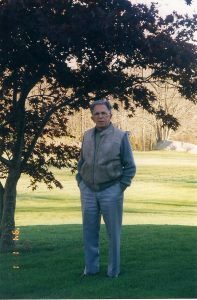 Dad standing near one of his favorite trees on his land (c. 2004). Dad’s home for the last 40 years of his life, was on four acres of land; it was on part of the farmland that he plowed with a team of horses, starting at the age of ten. When they were able to do so, he worked the land with the first modern tractors. For my grandfather, these were strange American machines with spiked iron, rear wheels, that took a prodigious amount of effort even to start their engines. One of these early machines Dad drove was a McCormick–Deering 10–20 tractor, which was built by International Harvester at its Chicago, Illinois Tractor Works factory. Even though the work was exhausting, and daunting for a young boy, let alone for a grown man, he was proud of the work he accomplished. He would often remark that even though hard work did not kill him, it came close to it frequently enough to be alarming. Before he was a teenager, he was using dynamite to blast the huge boulders remaining in the fields that could not be cleared away simply by using heavy equipment. He carried the dynamite caps in his pants and jacket pockets. While there was a sense of dread tinged within the stories he would tell me about his time on the farm, there was a greater sense of optimism about what he did accomplish on the land. In telling these stories it was as if a light would go on in him. I had my own private time machine in transporting me back to the early part of the twentieth century. I could even see it shining around him because he loved to be with his family, he was proud of what he could do with the technology of the day. The adults around him turned to him, relied on him to fix things that would not start, that were broken down. It seemed that he could fix anything, build anything, and accomplish the impossible. One time during the late fall of 1931, the family’s tractor would not start. All the men working on the farm took turns on trying to get it going, but to no avail. My grandfather, Vavu, had them go get Dad, who was working in another part of the farm. When they brought him back to the field where the tractor was standing, Vavu told them to watch his son fix the tractor. To their dismay, Dad did not start tinkering with the engine, first: he went and got some firewood, instead. To the adults’ growing consternation, Dad placed the wood underneath the tractor’s engine and proceeded to light a fire with it. Some of the men were angry as they thought my father was either being extremely foolish, careless or just did not know what he was doing correctly. Vavu counseled the men to be patient. They all held their breath, and their comments, as my father lighted the fire and got it going well. After a bit of time, Dad put the fire out. The men laughed and thought that was all he was going to do. However, Dad went through the process of getting the tractor ready to start and when he was done doing so, he stood in front of the tractor and turned the starting crank lever. On the third try, the engine fired to life. Dad climbed up onto the tractor’s seat, sat down at the wheel and drove the tractor down the field and started working it. The men, at first dumbfounded over what he had just accomplished, cheered. 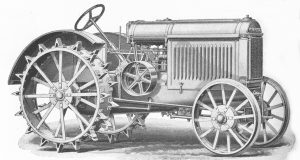 Image of a 1925 McCormick-Deering Tractor. It has taken me well over two months to be able to write this post. While these stories are inherently part and parcel of the fabric of my being, it has not been easy to write them down. When I initially tried to do so, I just could not summon the energy to help me focus on getting my thoughts down on “paper”. It seemed too overwhelming for me to portray the history of my father’s life, even though this entry has only taken me to the first years of The Great Depression. I guess the thought of Dad—counter–intuitive to the men around him—lighting a fire underneath the McCormick–Deering 10–20 tractor sparked my ability to start writing again. I hope to continue his story in the next blog . . .
†The Ford Model T was produced in Detroit, Michigan from 1908 to 1941. It had a 2.9 liter, 4–cylinder, 20 HP side valve engine with three main bearings. It was water cooled. The bore was 3¾ inches (95.25 mm), and the stroke was 4 inches (101.6 mm). To cold start the car, the engine must first be primed (Fuel needs to be put up into the cylinders to ensure that there’s gasoline to burn for the engine to start.). To prime the engine, the ignition key must be in the off position. One then has to go to the front of the car. The choke needs to be “popped” out. It is located at the bottom front left of the radiator. While the left hand holds the choke, the right hand holds the crank in preparation to turn it. Usually, it needs to be done three or four times. The crank is turned clockwise in about a three–quarter turn. Once the engine is primed, the handbrake—which is located on the left side of the front floor where the driver sits—is checked to see that it is engaged to prevent the car from rolling forward. The key (which is at 12 o’clock) is turned clockwise to the right to engage the magnetos, or to the left to the battery. Make sure that the spark advance lever (left side of the steering wheel) is completely all the way back. In this instance the lever is all the way up in its position. The throttle (lever on the right side of the steering wheel, which also acts as the accelerator) needs to be barely open. Returning to the hand crank at the front of the car, the driver uses his or her left hand to crank it. Using the right one can be dangerous. The engine rotates in a clockwise direction. If the engine “kicks” back while the crank lever is being held by the right hand, the right wrist can be easily broken. The crank is then engaged (pushed and then locked in place, which now places the lever in about the 8 0’clock position). The right hand, advisedly, holds onto the front fender to help stabilize one’s position. Then with a good half turn tug on the crank, the engine should start. Returning to the driver’s position, the spark advance lever is now advanced to ensure the engine runs more smoothly (the timing is now correct). If not done, the engine will not have power and fuel will be wasted. Given this procedure that someone had to go through to get his or her car started, I think makes this story even more humorous. For more information about my father’s side of the family, please see my 16 February 2016 weblog, “The Storytellers (Part I)”.